Vuelta Espana arrives in Alto de Angliru in Asturias, a Spanish region famous for the city of Oviedo. The stage is short but hard. The Angliru is a fearless mountain, 12 km terrorizing the group and bringing to mind so many emotional memories. This is the preferred climb of “El Chava” Josè Maria Jimenez, one of the greatest Iberian climbers in recent years. A pure talent, psychologically fragile, prematurely disappeared. Here won Alberto Contador and Gilberto Simoni but lost Chris Froome. Even the great British athlete received a great defeat on this ascent, most notably by a meteor like Juan Cobo, an unsettled athlete, but in that year, 2011, he could arrive before the 2 team Sky captains: Bradley Wiggins and Chris Froome. A double defeat however that allowed the white keniano to become the captain and thus officially take off his career. This is also the missing mountain in Marco Pantani trophy case. 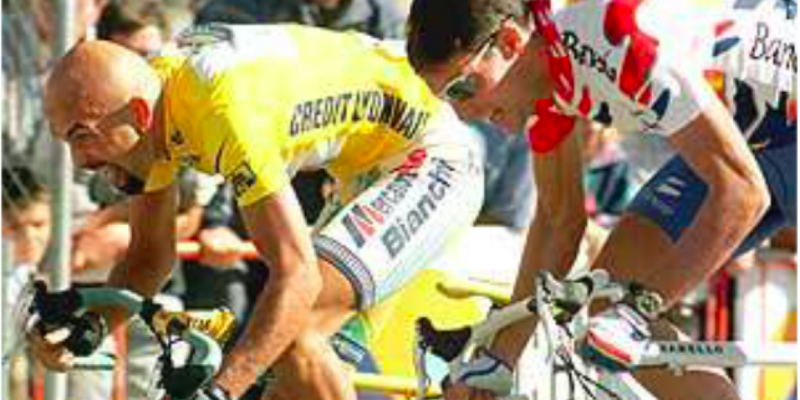 The Romagnolo was going to participate in the 1999 Vuelta to test himself on the Mortirolo of Spain. The Pirate, however, was stopped that year by the famous Madonna di Campiglio episode that in fact compromised his career. A climb so hard that make many people to doubt of its feasibility. Yet the Spaniards had decided to insert this ascent in their stage races to put a competitor to the famous Zoncolan and Mortirolo, two new climbs respect to the traditional Stelvio and Gavia, but able to envy the general public. VUELTA2017: We’re at the photo finish. After the victory of De Gendt entering the club of cyclists who can win a stage in the three major laps. Vincenzo Nibali chance to win are coming to an end, it will be difficult, almost impossible to succeed, but surely in the last battle he will give everything to win. THE STAGE: 117 Kilometers from Corvera de Asturias at Alto de l’Angliru. Angliru will not be the only ascent in this stage that will be really hard. Immediately the rise of Reigada, 12 kilometers of light uphill even not cataloged as Gpm. Then follows the Gpm finish, Alto de Cobertoria, 8 kilometers with 8.6% average slope. 1,995 meters downhill, followed by a descent of about 11 kilometers to the peak of the Cordal High, 5.7 kilometers to 8.6%. There is no stop, the descent start from the 96th kilometer, then down to the 105 kilometer where Angliru begins. There are 12 kilometers up to 9.8%. At the first kilometer, a 22% wall goes up slightly up to the fifth kilometer uphill, but in the end it does not drop below 10%. Predicted to 14% in mid-climb, with hardest climb at 23% at 10 km to end, only over the last 500 meters. It’s a tough end, legs will be put to the test, and only those who have more energy in the body will spit it out. The easiest thing is to sit in the chair in front of the TV and enjoy the show.